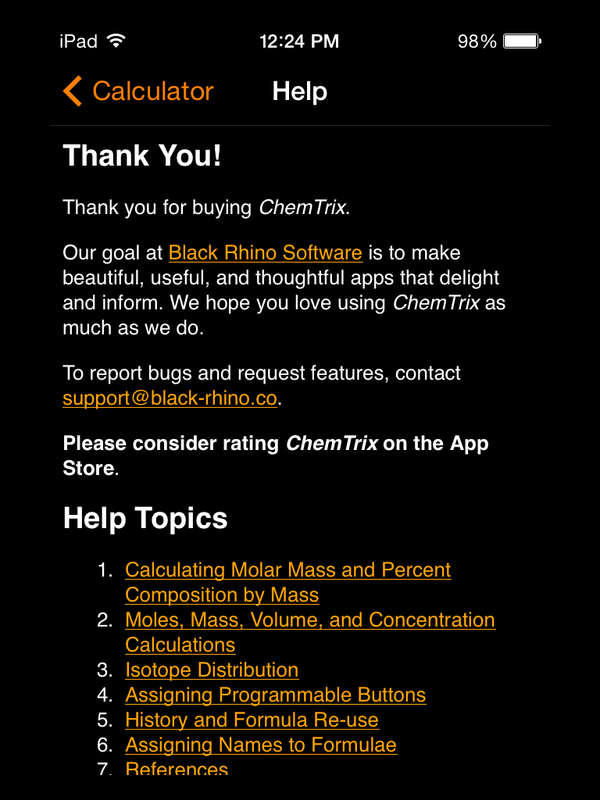 The kind folks at Black Rhino have supplied me with a copy of ChemTrix Chemistry Calculator for the iPad (https://itunes.apple.com/ca/app/chemtrix-chemistry-calculator/id605236459?mt=8). It is currently listed for $3.99 CAD. It has been evaluated on an iPad mini. The ChemTrix Chemistry Calculator app is exactly as the name advertises, an app to calculate typical chemistry values. All undergraduate chemistry courses require that some fundamental calculations are performed, both in the lecture and lab. Most calculations are fairly straight forward, as long as students possess the basic skills of unit conversion (dimensional analysis). 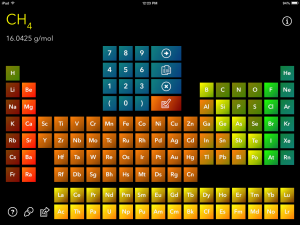 The opening screen features a large periodic table and number keypad. 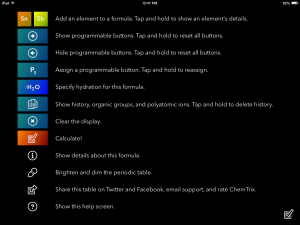 Simply choose the elements you want and punch in how many, then hit the orange checkmark button! 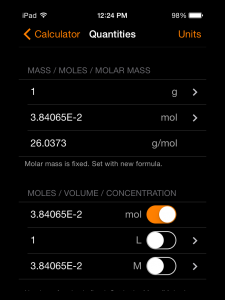 It will list the molecular weight on the main page, but clicking on the information button ( a lowercase “i” in a circle), it shows things such as the empirical formula, average mass, monoisotopic mass, percent composition (by mass) and converts between grams and moles. There is also a concentration calculator in the top right corner. All units in the mass-mole conversion/concentration calculators can be changed to the most common SI prefixes from nano to giga. 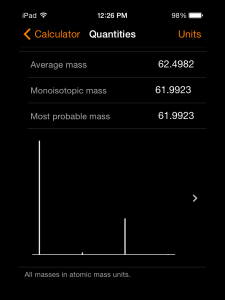 A mass distribution plot is also present, but is disappointing as it does not have axis titles/values. However, a peak table is given by clicking the arrow at the bottom right corner. 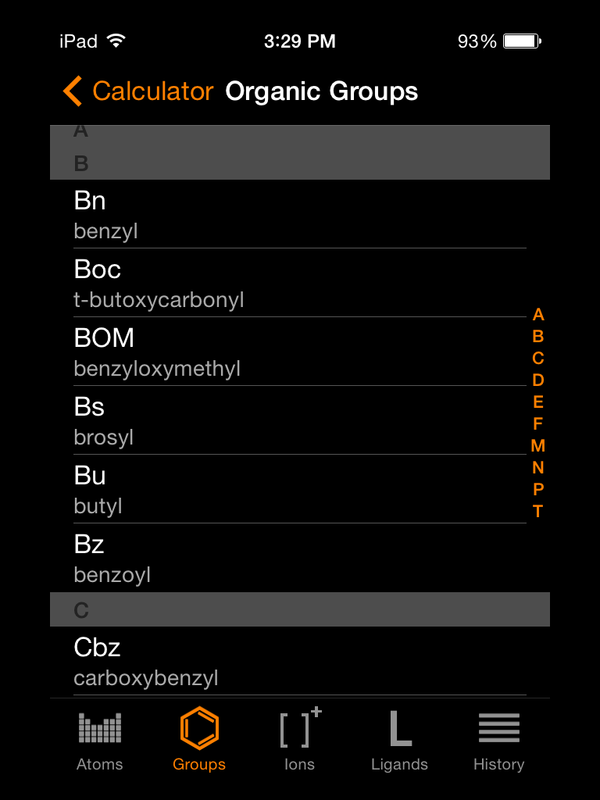 Back in the main screen, clicking on the icon that looks like two pieces of paper brings up a menu featuring the history of your previous searches, and surprisingly large lists of commonly used organic groups, ions, ligands. Clicking the right arrow button opens up a menu of programmable buttons, which would be handy for commonly used moieties. A help menu is available and is well written. Overall, this app can quickly determine molecular weight and perform some commonly used conversions, and has a surprisingly large amount of groups, ions and ligands programmed in. However, the conversions it can perform could be done fairly quickly by a relatively competent grade 11 student with a calculator, pen and paper. The author received a copy of the software, but received no other compensation. The kind folks at Wavefunction Inc. have supplied me with their full Odyssey general chemistry app suite and I will be reviewing each of these apps throughout the remainder of 2014. At VIU in our CHEM 140 class, and most other General Chemistry courses elsewhere, atomic orbitals are examined and explained in terms of the quantum theory. The topic of atomic orbitals and hybridization can be very visual, and yet also abstract with a lot of theory. 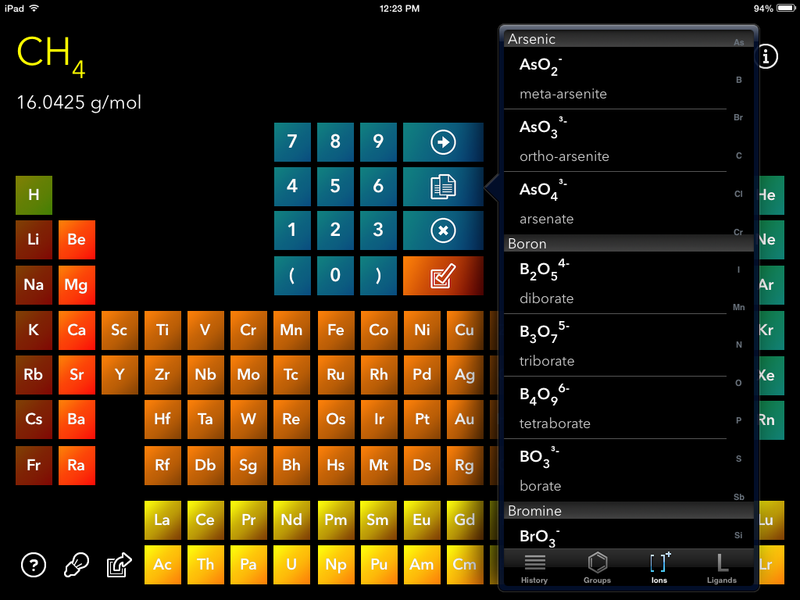 An app that can help student understanding in this tricky topic would be a great benefit in the CHEM 140 course. The interface is very similar to the other Odyssey apps previously reviewed. 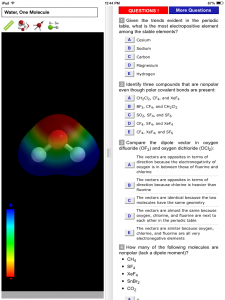 There is a portion where the orbitals are featured for manipulation and a portion which lists examples and has tabs for a glossary, some additional comments, and questions. As well, some guidelines towards how students should approach using the app are given in the OBSERVE! tab. The shapes of the orbitals can be clearly observed by clicking on each of the orbitals. 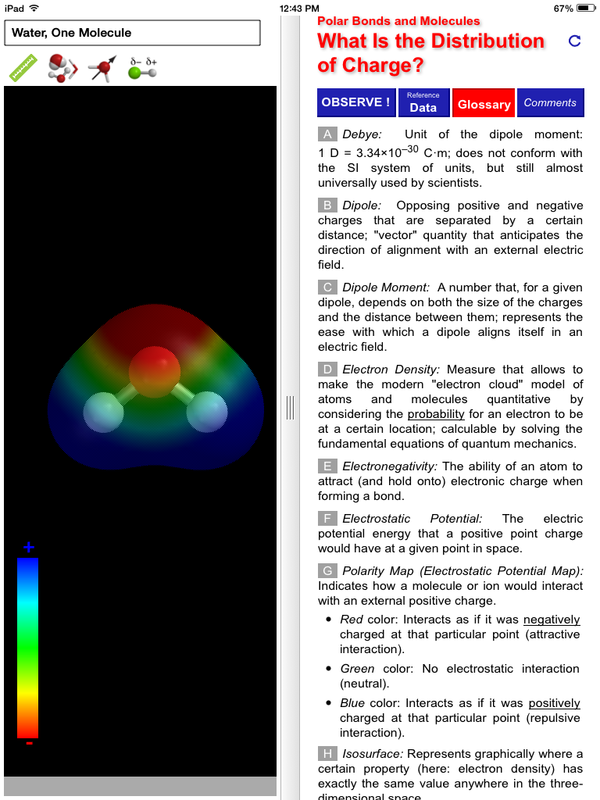 Pinch-to-zoom and swiping to rotate gives a full three-dimensional perspective on the orbitals. Under the Shell Structure of the Atom, the shell number can be chosen, showing the impact of the principal quantum number on the size of the atoms (compare the picture below at n=5, to that above at n=3). 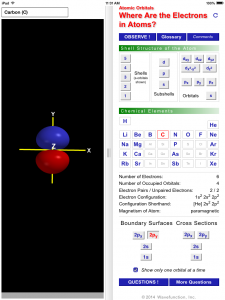 By selecting any of the 22 main group Chemical Elements provided, a list detailing the number of electrons, number of occupied orbitals, electron pairs/unpaired electrons, electron configuration (with shorthand) and magnetism appears, as well as buttons for each orbital of the atom. The glossary has a list of helpful definitions, and multiple choice questions are available under the question section. 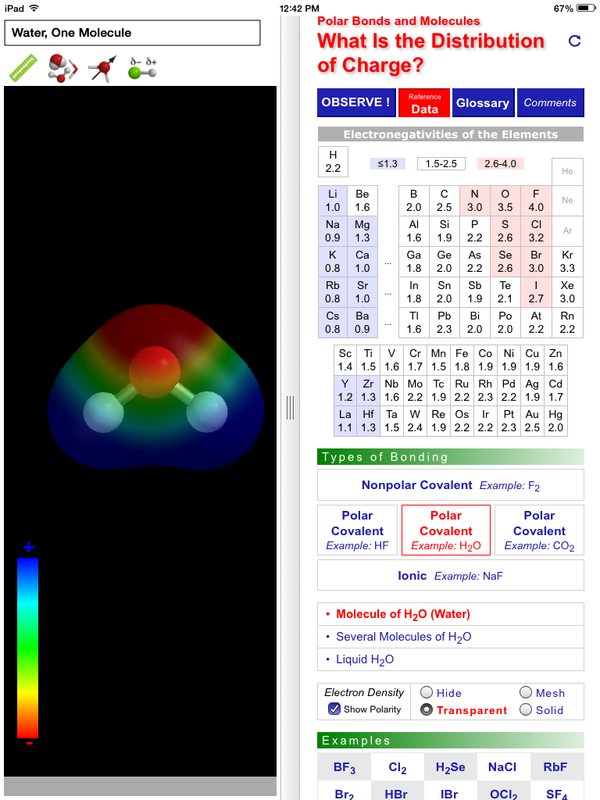 I think this is a really helpful app to get across the 3-D nature of the atomic orbitals beyond the scope of the 2-D textbook, and emphasize certain aspects of the quantum theory behind orbitals. For instance, I plan to use this app to show the effect changing the principal quantum number has on the orbital size during my lecture this fall. My main critique is that hybridized orbitals are not included, which are often a trickier subject for students. 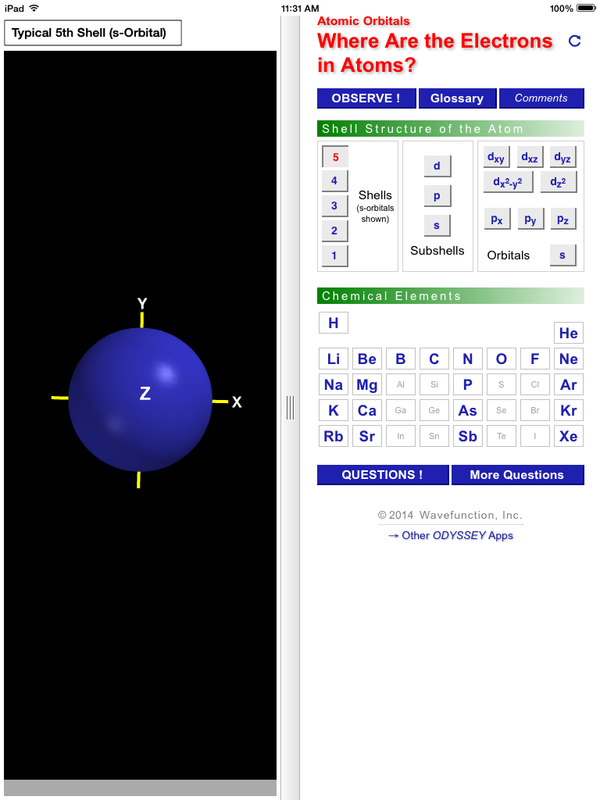 Hybrid orbitals are also taught in this type of General Chemistry course following atomic orbitals. 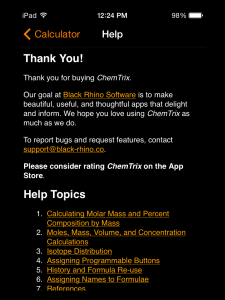 I have downloaded the app ChemTrix Chemistry Calculator by Black Rhino for the iPhone (https://itunes.apple.com/ca/app/chemtrix-chemistry-calculator/id549708598?mt=8) while it was briefly free in the appstore. It is currently listed for $3.99 CAD. It has been evaluated on an iPad mini. 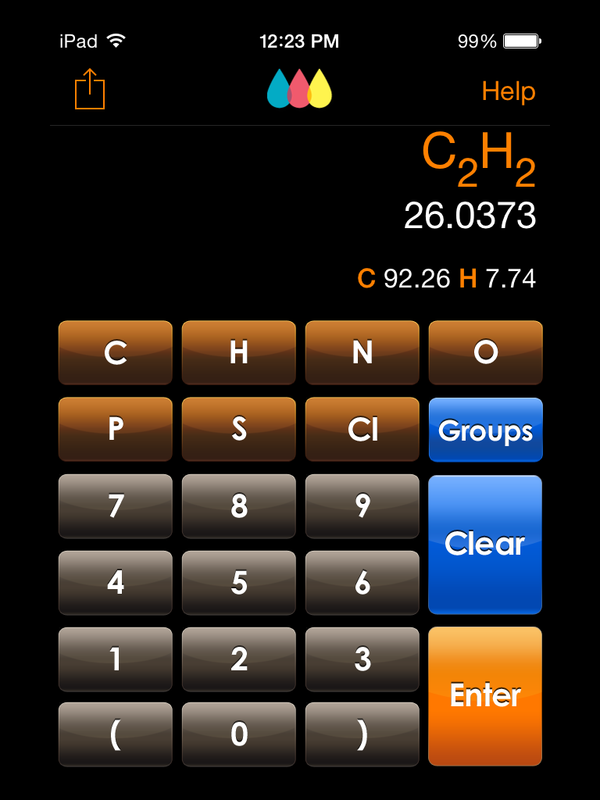 The ChemTrix Chemistry Calculator iphone app is exactly as the name advertises, an app to calculate typical chemistry values. 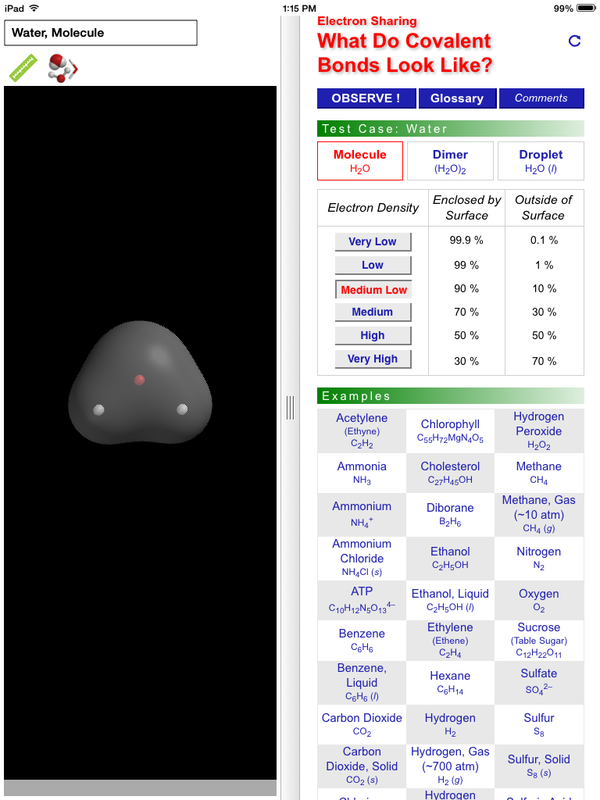 It can calculate things like molecular weight, monoisotopic weight, percent composition (by mass) and convert between grams and moles. 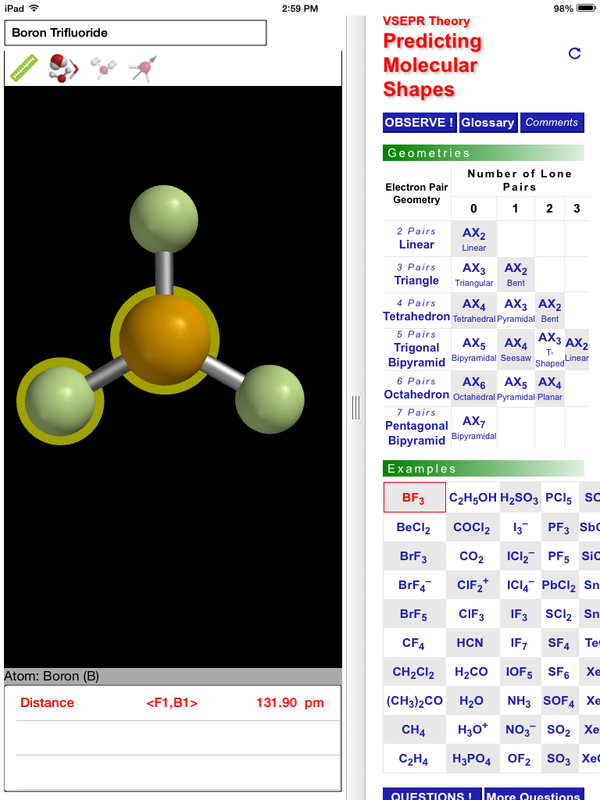 It is fairly intuitive and easy to use, like a normal calculator, just punch in the number of each element in the molecule and hit enter to view the molecular weight and percent composition. At first it appears that you can only choose from some of the more common elements (C, H, N, O, P, S, Cl), but a swipe from right to left gives a complete alphabetical list. 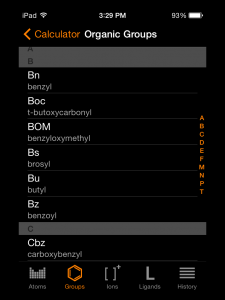 As well, it lists a surprisingly large number of commonly used organic groups, ions, ligands and the history of your previous calculations. Embarrassingly, this swipe feature eluded me at first! When in doubt, carefully consult the help menu or contact the Black Rhino support team, who were very quick to respond to my query. I have also been informed that if ChemTrix is run on a 4″ iOS device, a row of four programmable buttons will also be available (this review was performed on an iPad mini). Tap on the formula again and it opens up the mass/moles/molar mass converter where you can enter a mass or number of moles to convert between the two. There is also a concentration calculator, allowing you to determine the concentration. The units can be changed between 4 SI prefix options (eg. mol, mmol, µmol and nmol). 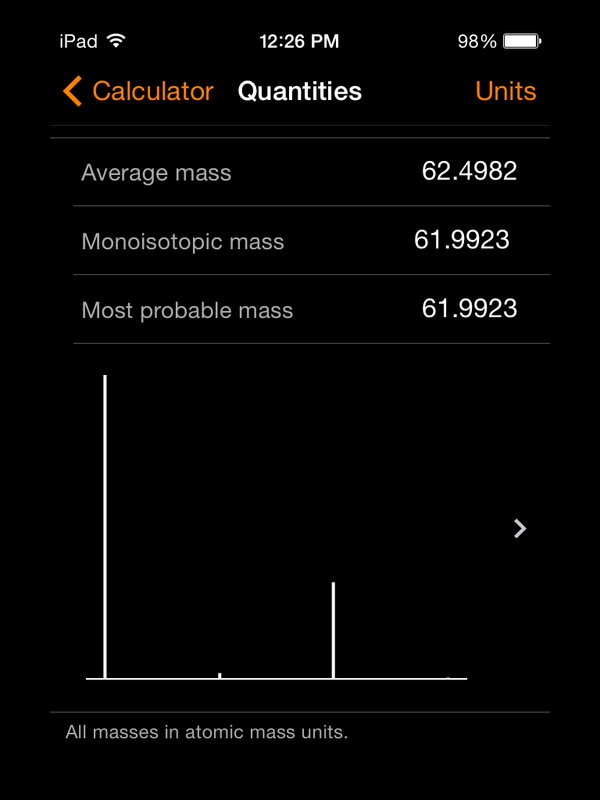 I was disappointed in the “Mass Distribution” plot, as there are no axis present. For example, I put in the simple molecule C2H3Cl: Chlorine has two common isotopes 35C and 37C, in a roughly 3:1 ratio. Therefore a signal should be present at approximately 62 and at 64, in a 3:1 ratio. This is not clearly shown in the spectrum provided below, but can be found by clicking upon it to pull up a peak intensities menu. 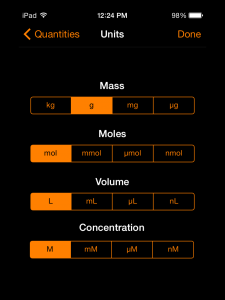 Overall, this app can quickly determine molecular weight and perform some conversions, and has a surprisingly large amount of groups, ions and ligands programmed in. However, the conversions it can perform could be done fairly quickly by a relatively competent grade 11 student with a calculator, pen and paper. 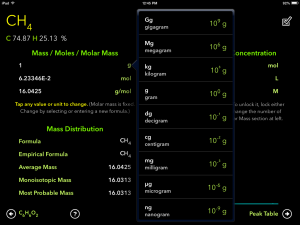 There is an iPad version of ChemTrix available, which appears to have expanded functionality, but I know many of my students use their iPhones (as a calculator particularly for quick calculations). I will be reviewing the iPad version in the near future. The author downloaded the software from the app store while it was briefly free, and received no other compensation. 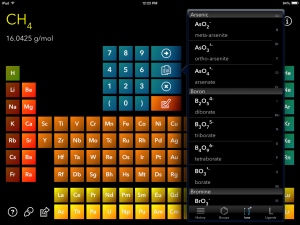 At first, I was very curious what this app could bring to the table that the previously reviewed VSEPR (http://wordpress.viu.ca/key2chem/2014/07/03/odyssey-vsepr-app-chemistry-ipad-app-review/) and Polar Bonds (http://wordpress.viu.ca/key2chem/2014/07/28/odyssey-polar-bonds-and-molecules-chemistry-ipad-app-review/) apps could not. Unfortunately, I was a bit let down, as discussed in my final impressions. Most first year general chemistry courses spend time discussing orbitals, electron density and bonding theories. At VIU our CHEM 140 is no exception. The interface is very similar to the other Odyssey apps previously reviewed. 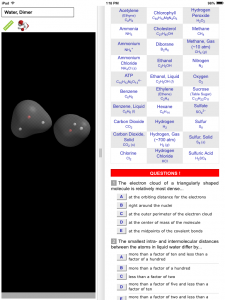 There is a portion where the molecules are featured for manipulation and a portion which lists examples and has tabs for a glossary, some additional comments, and questions. As well, some guidelines towards how students should approach using the app are given in the OBSERVE! tab. 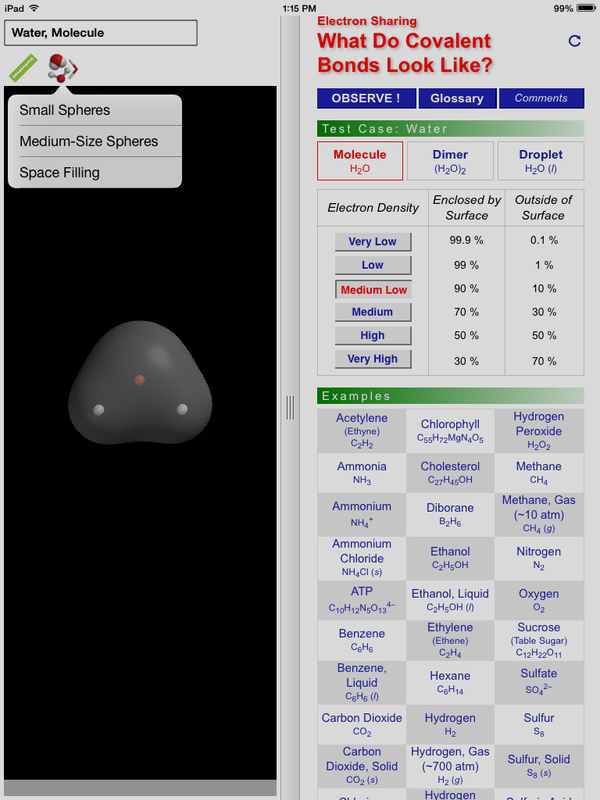 In this app, the molecules are only displayed as nuclei and electron clouds. Molecules can be rotated with a finger swipe, and expanded/shrunk with the pinch of the thumb and index finger. 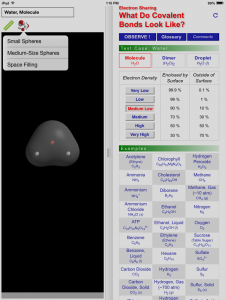 Nuclei can be shown as small spheres, medium-size spheres or the molecule can be shown as a space filling model. 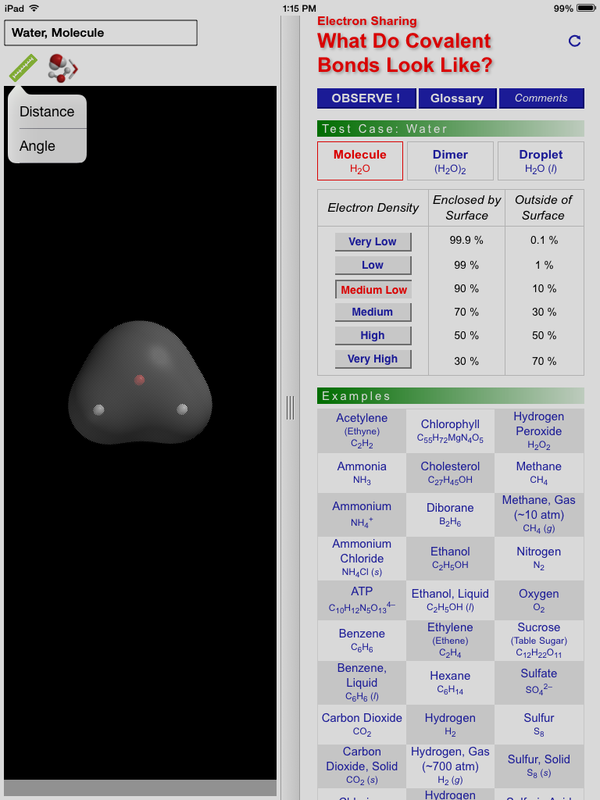 As well, the internuclear distance, and angle tools which have been featured in the two previously reviewed apps are also available. The main novel feature of this app is that the user may adjust the electron density shown, from very low where almost all (99.9%) of the electrons are enclosed by the isosurface, to very high where only 30% of the electrons are enclosed by the isosurface. 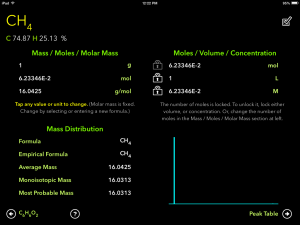 There are 30 example molecules that can be examined, and some multiple choice questions are pre-loaded into the app. Similar to the previous apps reviewed, the questions can be scored automatically by the app. 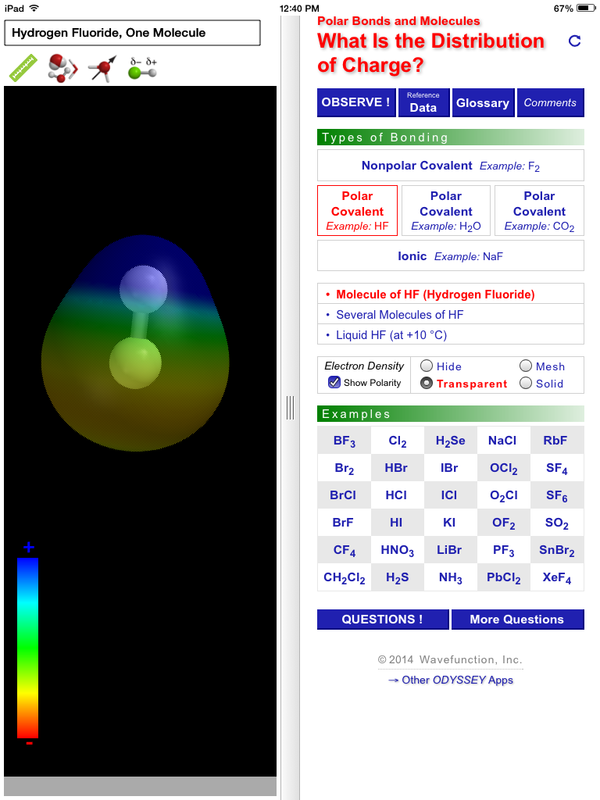 Ultimately, I believe the goal of this app is to provide students/users with a view of molecules beyond the simple ball and stick model. It does this by focusing on nuclei and electron clouds, and does allow for the manipulation of the electron density shown. 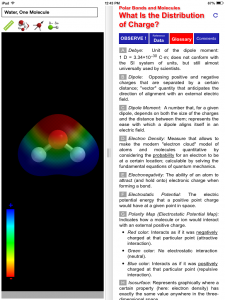 However, it seems the other Odyssey apps accomplish this already with electrostatic potential maps etc., and almost all modern textbooks include electron cloud and electrostatic potential diagrams already (granted, they are static in nature). I do not believe there is enough to this app to justify the $3.99 pricetag, and I think many students would lose interest after a few minutes. This app was a little disappointing after reviewing the previous Odyssey apps. The kind folks at Wavefunction Inc. have supplied me with their full Odyssey general chemistry app suite and I will be reviewing each of these apps throughout the remainder of summer 2014. 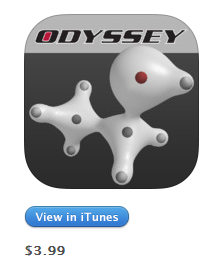 At first, I was a little baffled why this is its own separate app, as there is a polarity function built into the VSEPR app, which was previously reviewed on this blog (http://wordpress.viu.ca/key2chem/2014/07/03/odyssey-vsepr-app-chemistry-ipad-app-review/). 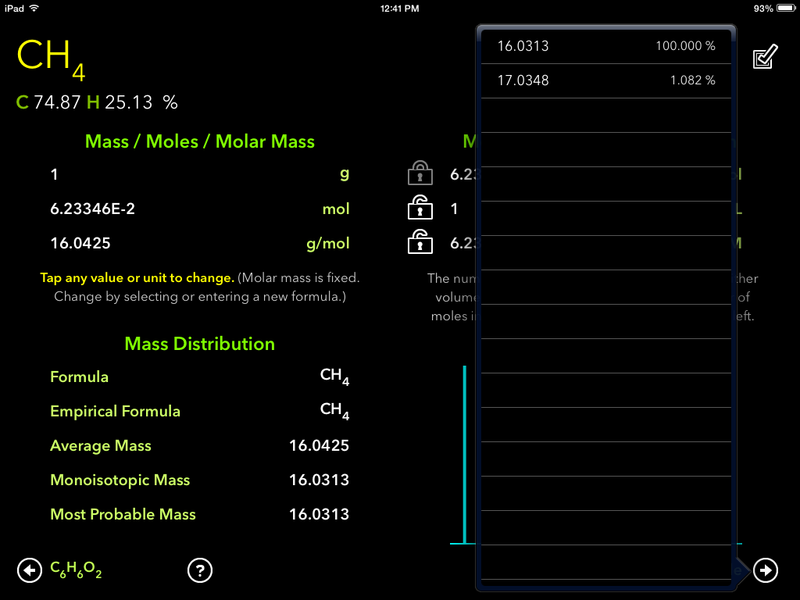 However, there are a few additional features built into this app which are not found in the VSEPR app. 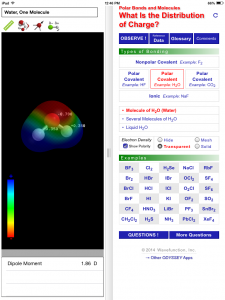 Most first year general chemistry courses spend some time discussing chemical bonding, covering topics such as: ionic and covalent bonds, bond polarity, electronegativity, and Lewis structures. At VIU, our CHEM 140 course is no exception and covers electronegativity, determining if bonds are covalent or polar covalent, drawing polarity arrows (dipole moments), and determining net molecular dipoles. The textbook we use has a fair amount of examples and end-of-chapter questions, but these are certainly skills that many students may want to seek additional practice and resources to master. 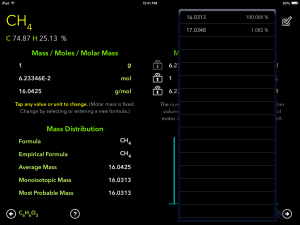 The interface is very similar to the VSEPR app (previously reviewed). There is a portion where the molecules are featured for manipulation and a portion which lists examples and has tabs for reference data, a glossary, some additional comments, and questions. Molecules can be rotated with a finger swipe, and expanded/shrunk with the pinch of the thumb and index finger. They can be displayed as Ball and Wire, Tube, Ball and Spoke or Space Filling models. 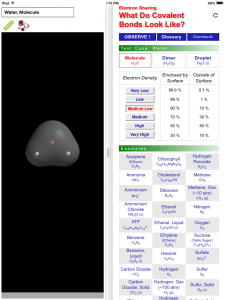 One feature that I really like is the ability to show the molecules as electrostatic potential diagrams, which can be enabled/disabled by clicking the “electron density” selection box on the right side just above the list of example molecules. The ruler button allows for the calculation or the bond length, angle, and the dipole moment. 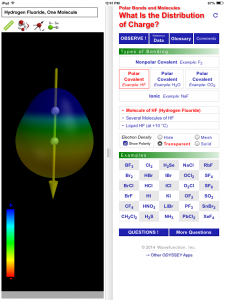 And the dipole moment can be shown using the arrow notation or as a partial charge by clicking the remaining two buttons on the left side window of the app. 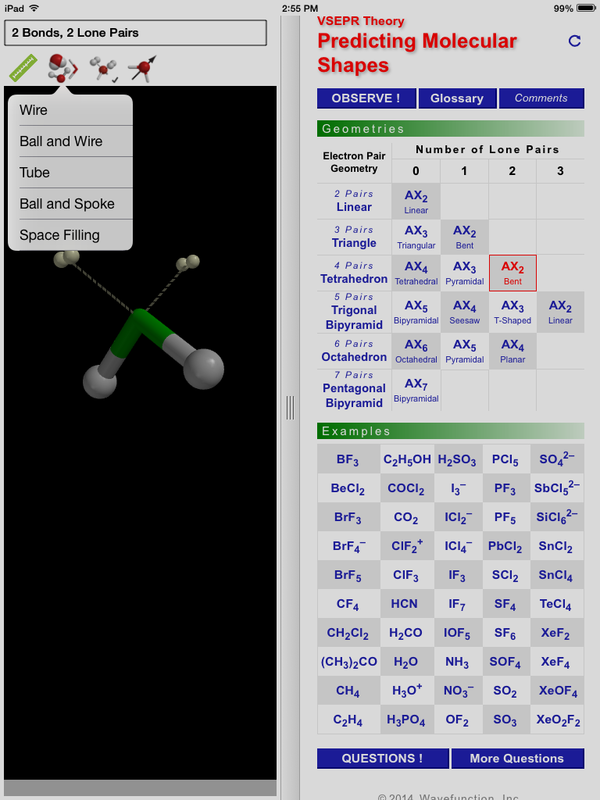 In the window on the right side of the app, some examples of the common bond types are available (non-polar covalent, polar covalent and ionic). 25 additional molecules, which are not classified into the three bonding types mentioned, are also available as examples. Some guidelines towards how students should approach using the app are given in the OBSERVE! tab. A table of reference electronegativities is provided under the reference data tab, and a glossary is provided as well under its own separate tab. The comments tab provides some additional technical notes, such as noting how to change the polarity arrow from the common use form (positive end to negative end) to the not-so-commonly used IUPAC (negative end to positive end). 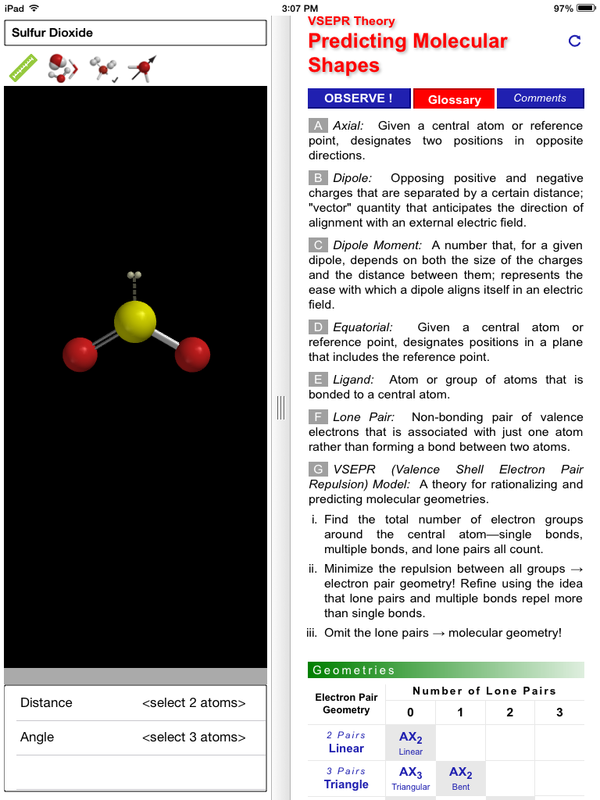 The questions which are pre-loaded into the app are multiple choice and are similar to those which appear in the end-of-chapter section of most textbooks and focus on the difference between the bonding types and molecular polarity. These questions would likely get students to open up the example molecules to find the correct answers, and the questions can be scored automatically by the app. 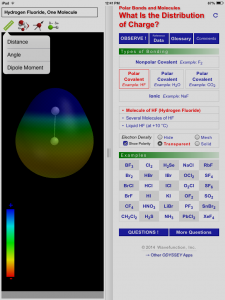 This app does provide some additional features beyond the VSEPR app, including dipole moment calculation, and questions specific to polarity and types of bonds. 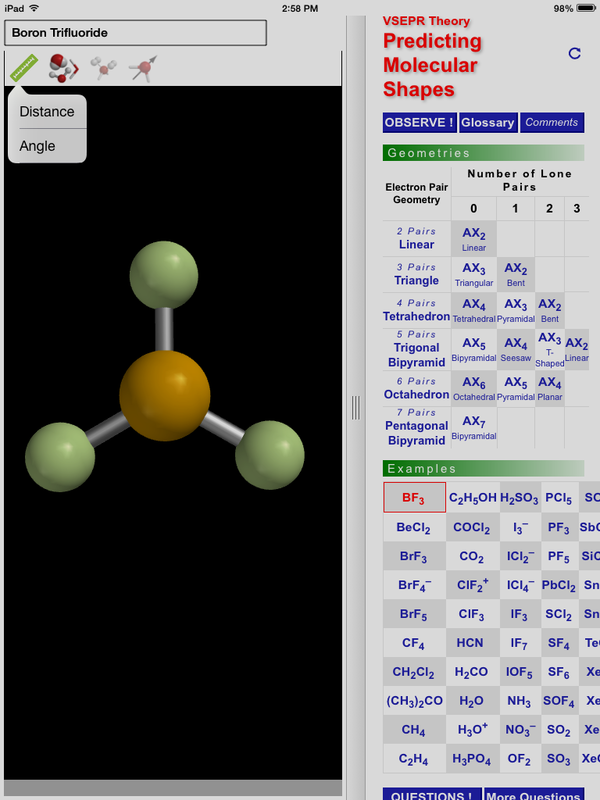 Some may wonder why this was made into a seperate app, and not just included with the VSEPR app to make one really great app. I really like the use electrostatic potential diagrams, as I try to show these types of diagrams as much as possible in class. 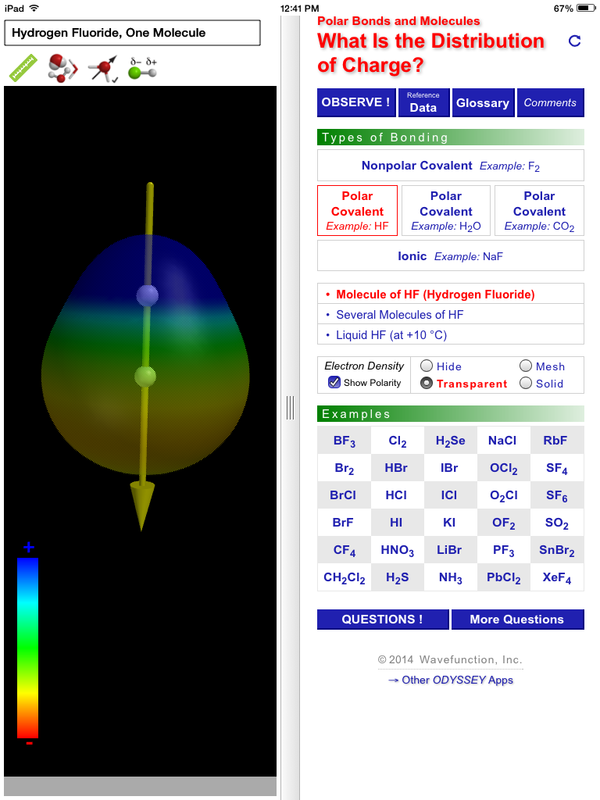 I think a really important learning tool that could be added by the developers would be some way to have students predict the net molecular dipole moment (the direction of the polarity arrow for a molecule with more than one polar covalent bond). 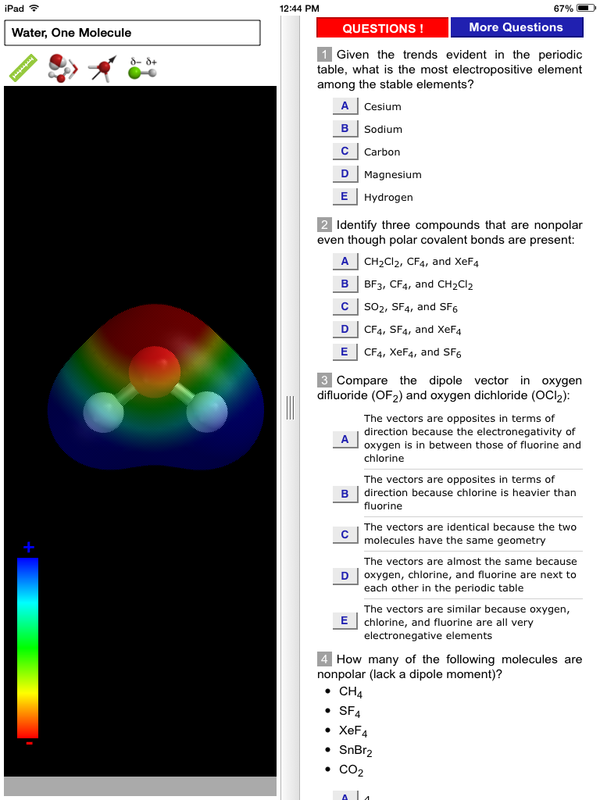 Many students struggle with the idea of vector summation and predicting net molecular dipole moment. I will certainly provide a link to this app when we discuss this topic in the fall semester, and hopefully I can get some student feedback. The author received an evaluation copy of the software from Wavefunction Inc., but received no other compensation. The first app I have chosen to review is the Odyssey VSEPR Theory app (https://itunes.apple.com/ca/app/odyssey-vsepr-theory/id869643629?mt=8), which sells in the app store for $3.99 CAD. Like many first year general chemistry courses, at VIU our CHEM 140/150 courses cover the concept of VSEPR theory, and how to determine Lewis structure, molecular shape and polarity. These are fundamental concepts which many students struggle with, perhaps due to the 3D nature of molecular shapes or perhaps due to the vector summation required to determine a net dipole moment. To give students experience with these skills, we have included a “dry lab activity” on Bonding and Structure over the past several years. One aspect of this activity is that students are asked to fill out a table (with the formatting shown below) for eight molecules. Figure 1. CHEM 140 Drylab Table example. Traditionally we bring model kits for the students to play around with, and have copies of the textbook available and opened to the relevant chapter. 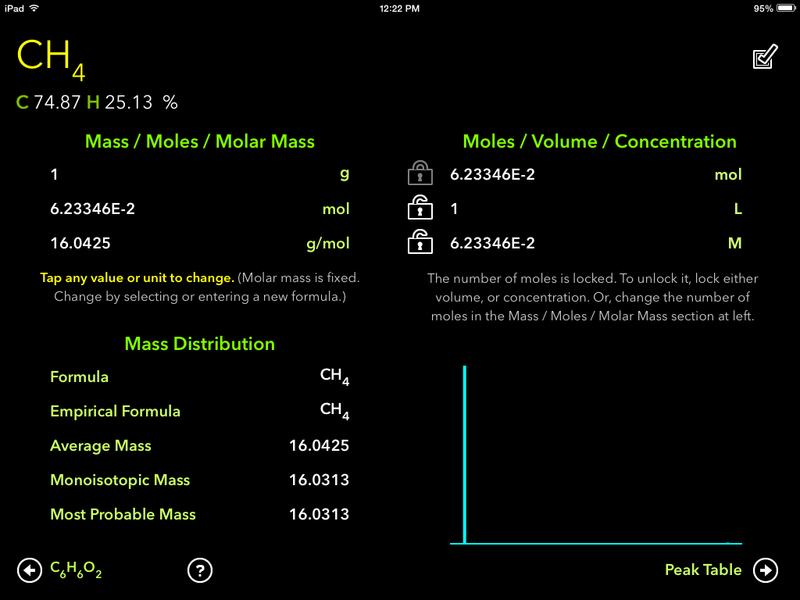 However, when I saw this app I was immediately excited that we could use it to improve this particular dry lab. 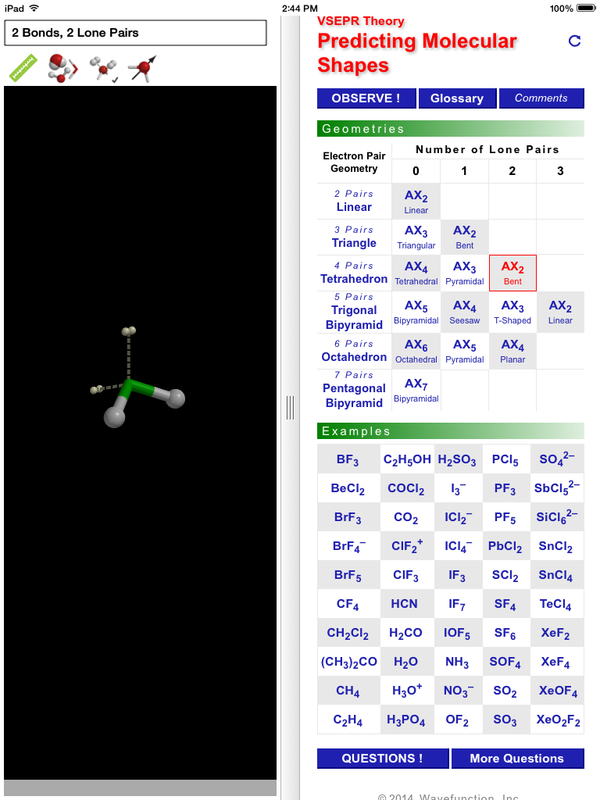 The interface is broken into two portions, an area where molecules are featured for manipulation, and an area that features both a table of generic geometries possible (broken down by the number of lone pairs and electron domains) and a bunch of example molecules. Figure 2. 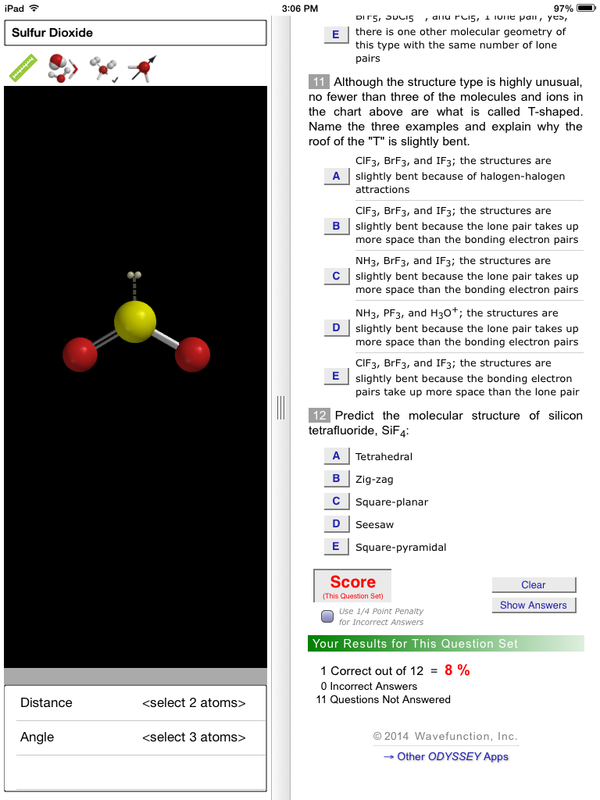 VSEPR app 1. In the molecule manipulation window, you can rotate the molecules in 3D with a swipe of your finger, or expand/shrink them with a pinch of the thumb and index finger. The molecule can be displayed as wire, ball and wire, tube, ball and spoke and space filling models. Figure 3. Molecule representation options. As well, the lone pairs of the central atom and net molecular dipole moment arrow can be added or removed with a single click to each of the right most buttons. 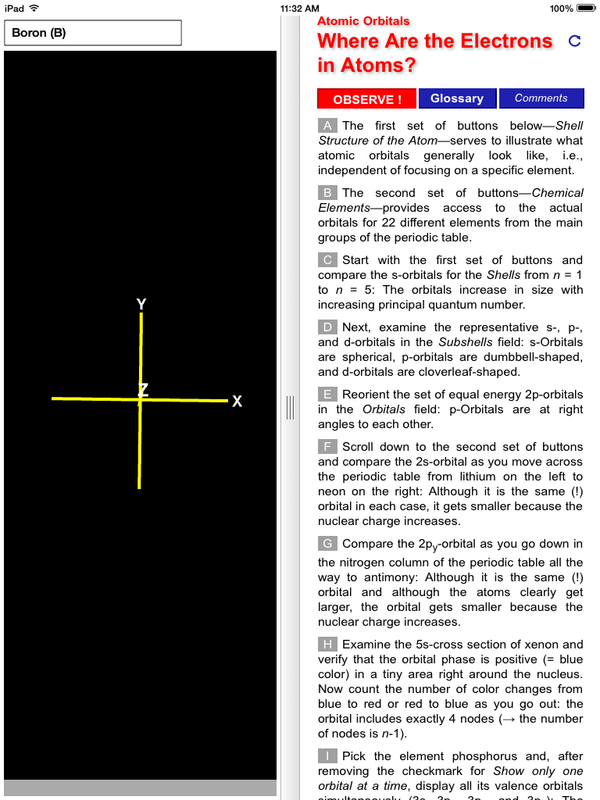 The distance between two atoms can be determined by clicking on the ruler, and selecting the distance option, then selecting the atoms of interest. Figure 4. Distance and angle from ruler button. Similarly, the bond angle between three atoms can also be calculated by clicking on the ruler, and selecting the angle option, then selecting the atoms of interest. Figure 6. Bond angle calculated. 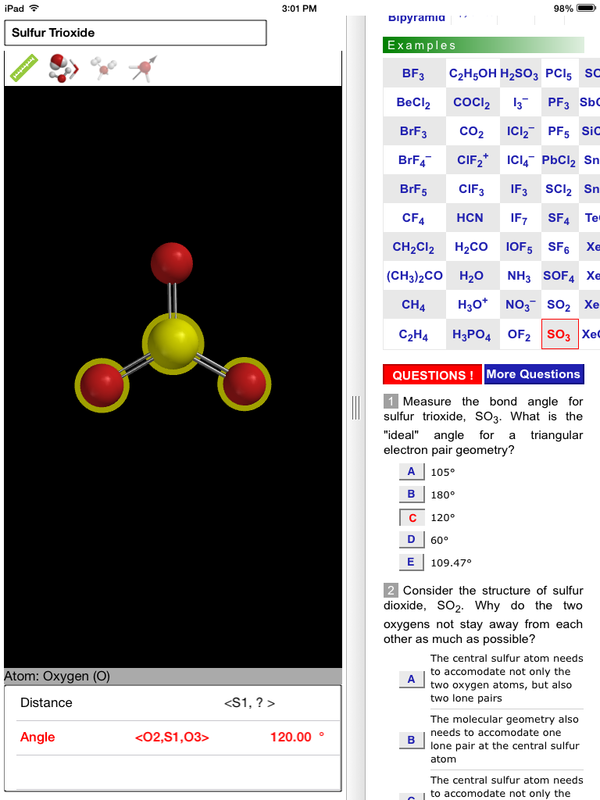 There are questions pre-loaded into the app with multiple choice answers that force the user to work through several of the example molecules. Figure 7. In app questions. The responses can be automatically scored in the app, and after trying most of the questions there is the option to view the correct answers. A glossary is also included, which defines several terms including: axial, dipole, dipole moment, equatorial, ligand, lone pair and VSEPR. 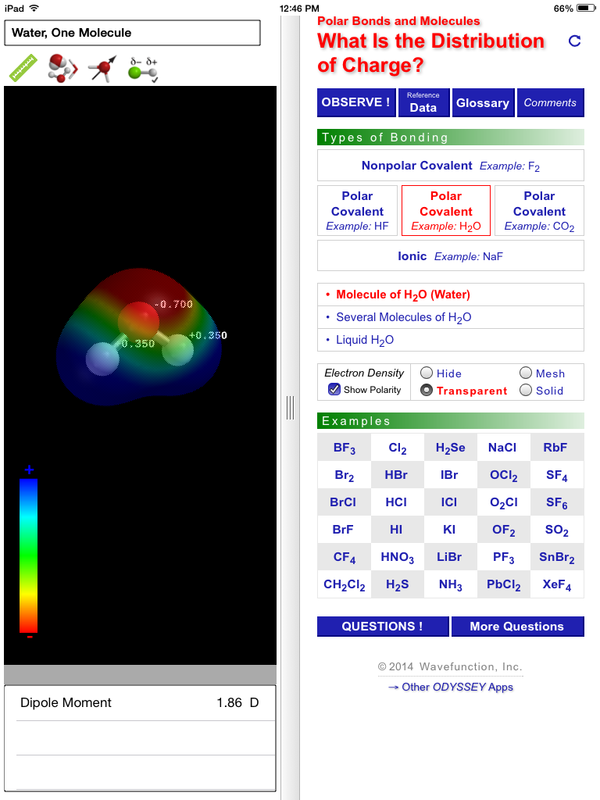 Although the app is limited to the “canned examples” included, there are a decent amount and they certainly cover the fundamentals explored in a typical discussion of VSEPR at the first year general chemistry level. 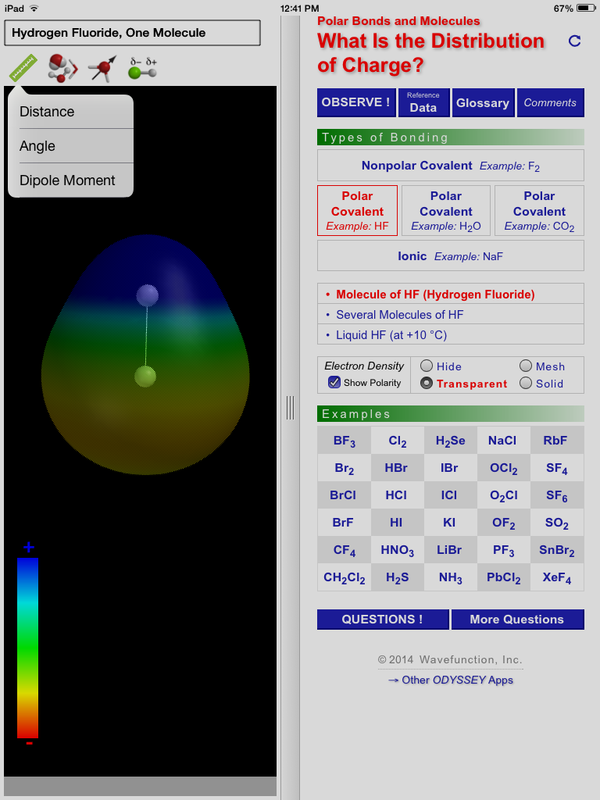 I plan to use this app in the fall semester to highlight the 3D nature of molecular shape in my CHEM 140 lecture by hooking up my ipad mini to the project. If we are able to scrounge up a class set of ipads, I could see this replacing or enhancing the current pen-to-paper method used in the dry lab. The author received an evaluation copy of the software from Wavefunction Inc, but received no other compensation. I have been working on video tutorials for general and organic chemistry since the start of 2013. Recently I have been trying to take advantage of my iPad for this purpose, but found very few good quality screencapture or whiteboard apps. The app I have chosen to review, ScreenChomp for iPad, is in my opinion the best option currently available. ScreenChomp is a free app developed by TechSmith, the same people that have brought us the industry standard screencasting software Camtasia, and the free screencapture program Jing. ScreenChomp is a whiteboard app, which means it can capture drawing and writing on its whiteboard surface, but cannot capture other programs like a screencapture program. It is also able to capture surprisingly good audio, allowing you to chalk talk effectively. You can insert pictures as the background, allowing for explanation of diagrams or talking through individual powerpoint slides. Once you are finished recording, the video is uploaded to ScreenChomp’s server and can be shared as a link, or tweeted to your followers. The feature that really sets this app apart from its competitors is that you can also download your video file as an .mpeg4 file. This enables you to edit, combine or otherwise modify your video, however you like, in a separate video editing software. I recommend using ScreenChomp for quick explanations or chalk talks at ‘low resolution’, but for longer/complex purposes use a pc or mac based screencapture software like camtasia or active presenter. Disclosure: I was not compensated in any way for this review. 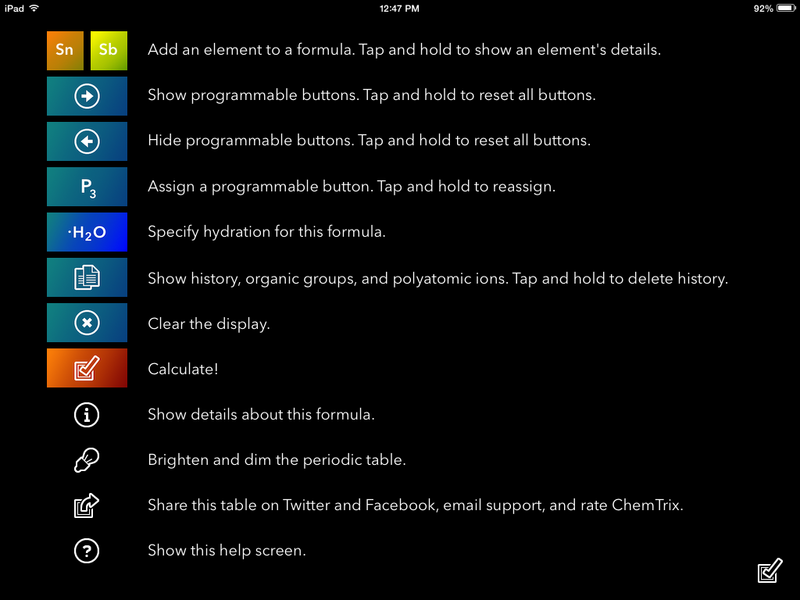 A major update has just been released for the ChemDraw app. It seems the folks at PerkinElmer really listened to the feedback they received from users and reviewers because they have addressed most of the major issues I ranted about earlier. The app has gone from a mediocre novelty to a truly useful product that I can recommend to students or colleagues with a straight face. Text can now be placed into your drawings, allowing for the inclusion of reaction conditions. You can even change font, colour and size. The choice of arrows has been expanded to include most typical arrows like resonance arrows and equilibrium arrows. The overall style has changed to the industry standard ACS style sheet, but it would be nice if additional styles could be used as well. Finally, a series of templates has been introduced including bicyclics, Fischer and Newman projections and chair conformations. This new feature is really ideal for students taking introductory organic as they learn about stereochemical relationships and representing organic molecules. My one remaining complaint: I would really like to have the align and distribute objects options, as they really help to make clear, professional documents. Maybe this will be included in a future update, but as it stands I now recommend this app for both instructors and students. I approach this from the point of view of a chemistry instructor. 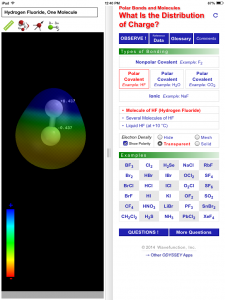 I would like to use a mobile chemistry drawing software to prepare lecture notes/problem sets, solve problems in-class, or to encourage students to use it for studying, doing problem sets or preparing lab reports. 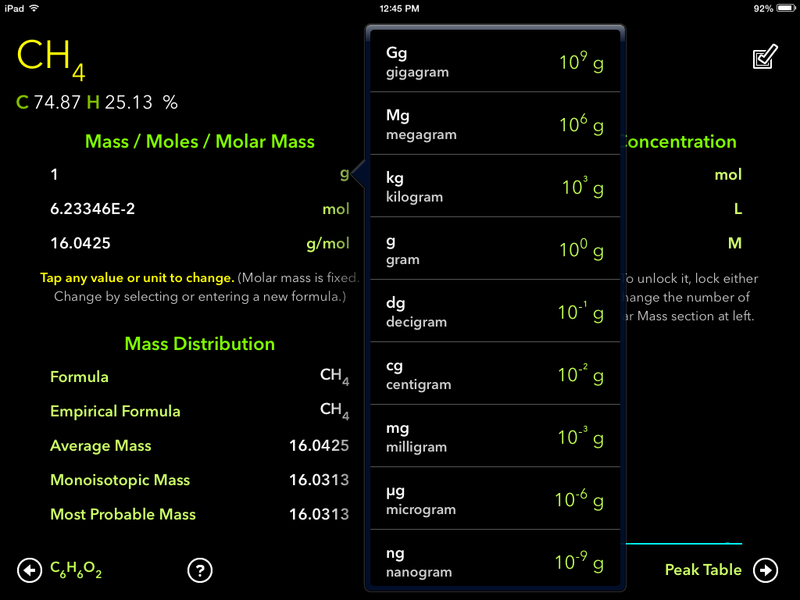 But for these goals, similar to other productivity apps for the iPad, ChemDraw for iPad falls significantly short of its full version counterpart. In its current form, I can only see myself using this to roughly jot down some structures when I am on the go. I would then need to email myself the .cdxml file to format and edit on the full version of ChemDraw. With no dropbox/google docs/icloud syncing feature, I think many users will just stick to drawing manually in a notepad app like GoodNotes, then use the full version of ChemDraw at a later time. As well, I would not strongly recommend this software to my students. At Vancouver Island University, we currently do not have a site-licence for the full version of ChemDraw, which would greatly reduce this apps usefulness for students. Thus without the ability to copy or paste the structures they generate into some sort of word processing or notepad app, the ChemDraw app seems more like a 9.99$ novelty. It does offer some neat features like assigning R or S, and E or Z, but does not include IUPAC naming and some other desirable features. I think this software is a step in the right direction, but does not quite meet my requirements. However, I am told a major update will be available in a couple of weeks (mid-September 2013?) which may improve functionality. Please find below a list of pros and cons that I have compiled, and links to other reviews of this product. – Only one arrow size is available… ridiculously large, only 5 arrow types available… does not include resonance arrows or equilibrium arrows! My old laptop, which got me through grad school, is on its last legs. It appears after 7 years, numerous scientific publications and 436 pages of doctoral thesis it has finally bit the dust. It is slow, taking several minutes just to turn on. It overheats, recently so badly that part of the screen is turning black. So I finally caved, and purchased a shiny new ipad to fill the void of home web-surfing and minor document and powerpoint editing needs. First impressions are that it can almost do everything my antiquated laptop did, but it does it in an awkward way in many cases. To perform word processing I purchased Pages (by apple) and for powerpoint editing I purchased Keynote. Both of these apps are capable of creating their respective document types, and saving as microsoft compatible .doc and .ppt formats. However, many familiar fonts are not available, and saving to shared places like dropbox is awkward at best. I will continue searching for better work-arounds, and also to expand my chemistry app resources. If anyone has any suggestions let me know! Reviews of any products tested will be posted when available.